Whether a buyer is looking for a lightweight tool for occasional use or is hoping for freedom from tangled cords, a cord free jigsaw fits the bill. The best cordless jigsaw is one that suits your needs, and between weight, battery life, and cost, there’s a lot to consider. 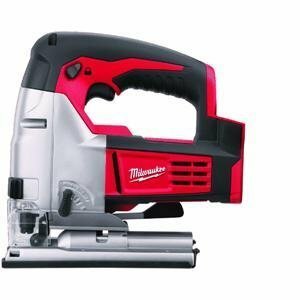 ​We've gone through the top 5 models to put together our cordless jigsaw reviews, along with provide our suggestions for which one works best depending on your situation. Below our recommendations, we list out all of the features you need to pay attention to when considering your options. While portability is high on the list of cord free ​flexibility, you also need to ensure you are getting a powerful saw that will stand the test of time. We’ve compared five models and compiled ​our cord free jigsaw reviews so you can make an informed purchasing decision. We'll share the highlights for each model, along with any drawbacks it might have when compared to other options. A compact unit that uses an 18-volt lithium-ion battery, the Bosch JSH180B 18-Volt Jig Saw has a one-handed blade change system that lets you avoid touching the blade itself. Just turn the knob to eject the blade, then insert a new one. ​In our opinion, out of all the models we've reviewed, Bosch makes it the easiest to quickly change your jig saw blade. This might sound like a luxury, but it won't take you long to realize how convenient it really is. We would actually argue that this convenience is a necessity if you start using your saw for any larger project. ​​This Bosch also has a blower that constantly runs while the saw is in use helps clear your view, without requiring you to flip a switch mid-cut. An LED light highlights your project for clarity even in dim conditions and stays on as long as the unit has power. This Bosch jigsaw is amazingly lightweight, coming in at just over 5 lbs. Often times, lightweight jigsaws are a sign of a cheap saw, and don't always feel hefty enough to do the job. The Bosch jigsaw is not like that, though. It's light weight combined with it's ergonomic design leaves it feeling great in your hands, and yet light and easy to use. An electronics package protects the machine against damage with Electronic Motor Protection and Electronic Cell Protection if you purchase the branded battery that matches the unit. These features prevent the motor from becoming overloaded, prolonging its life. Battery protection avoids overload, overheating, or deep discharge. ​One drawback to Bosch’s JSH180B is that it does not come with the required 18-volt battery. Although the product page specifies that this is a bare tool, buyers who are not familiar with the terminology may receive a surprise when the package arrives. To be clear, this is pretty common. Only one jig saw in our review here comes with a battery - most expect you to already have one (or purchase separately). You’ll also need to buy a case separately because only the JSH190BL model comes with a tough plastic case. However, the 45-degree bevel angle range of the JSH190B still make the unit worth the cost. It also has plenty of power to complete that involve wood, aluminum, and steel cutting. At the same time, with the task of running the saw, the LED, and the blower, batteries may drain quickly. However, the battery life appears sufficient for average use, and keeping an extra on hand is always a good idea regardless. 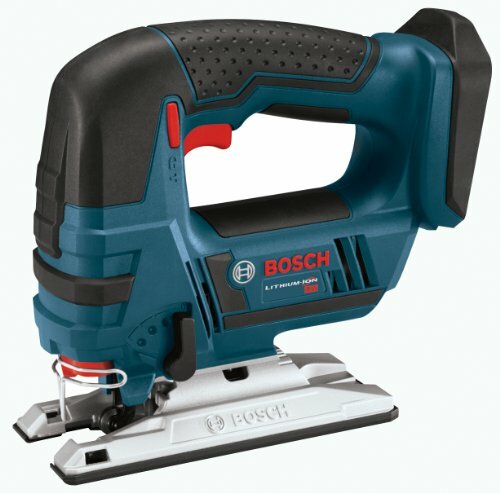 ​You can't go wrong purchasing the Bosch JSH180B 18-Volt Jig Saw, and we vote this the best cordless jigsaw overall. 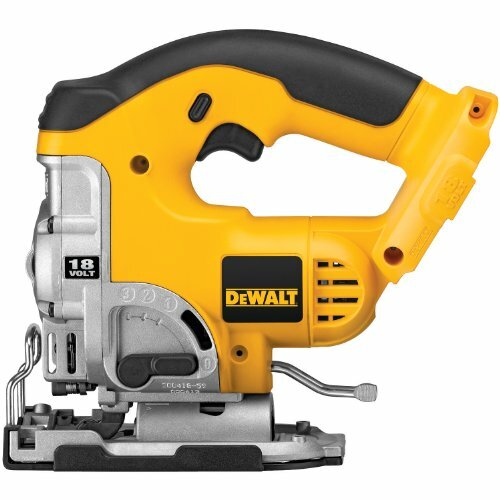 A​nother bare tool that arrives sans battery is the Dewalt DC330B 18-Volt Cordless Jig Saw. This model takes an 18-volt NiCAD battery and has a range of features that make it competitive in its category. A substantial fit in your hand without excess weight keeps the unit portable, so it travels well. A balanced weight makes the saw handy, and its anti-slip grip offers added comfort. Plenty of horsepower lets you tackle big jobs, including solid wood, plywood, laminate countertops, plastic, metal, and according to Dewalt, even wood with nails in it. An additional service contract comes with the tool, which means the company will maintain the saw and replace worn parts for one year. A three-year warranty also covers manufacturer defects. However, the smooth operation makes it less likely that you’ll need the service plan, although the peace of mind is a benefit. ​Due to the locking clamp on the blade, which makes switching the blade simple, the piece can slip out without proper adjustment. To avoid blade slippage, ensure that the blade locking system is engaged. The unit also requires t-shank blades, rather than the standard universal type, so consider this when supplying your toolbox. An adjustable blower gives you customization options on this unit, so if you don’t need the blower on a job, you can dial back the function. Match the speed of the saw to each job, and you can slow down for tight spots and intricate work. ​Overall, this Dewalt Cordless Jig Saw will serve you really well for heavy duty projects. Because it comes with a battery, the ​Milwaukee 2645-20 18-Volt M18 Jig Saw lands at a higher price point in comparison with similar models. Its 18V lithium-ion battery claims a recharge time of one hour or less, but the package also comes with a spare battery, so you spend less time charging and more time working. The manufacturer boasts the unit’s ability to cut through plastic laminate, plywood, drywall, sheet metal, oriented strand board, and other materials. Because of its ruggedness, it is heavier than comparable units. However, its ergonomic molded grip helps you hold on. While it may better suit ground applications, the weight of this saw reduces vibration while cutting. However, it’s closer in weight to corded models, which is a drawback for users wanting lightweight utility. ​Tool-free bevel changing and blade changing lets you complete jobs faster since you’re not searching for tools to make changes. The Quik-Lok blade clamp allows for keyless blade changing, a trademark of Milwaukee’s line of jigsaws. Each battery includes a power gauge that shows the amount of runtime remaining, so you don’t have to rely on guesswork to determine when it’s time to charge. Milwaukee also uses a Digital Power Management technology that helps to maintain long battery life. Lack of an LED guide means you’ll need an auxiliary light source, but this otherwise all-inclusive package includes the jigsaw unit, two batteries, a charger, and a case to cart it all to the job site. The warranty lasts five years so that you can reach out to Milwaukee with any concerns. ​We love the​ Milwaukee ​M18 Jig Saw​, particularly for horizontal use. And, it comes with a battery, saving you that additional purchase! Smooth cutting and exceptional visibility make the Makita XVJ03Z 18-Volt Jig Saw a contender for ease of use, and quick battery recharge time means you spend less time waiting around. A trigger control for speed lets you customize the experience depending on your material and level of precision. 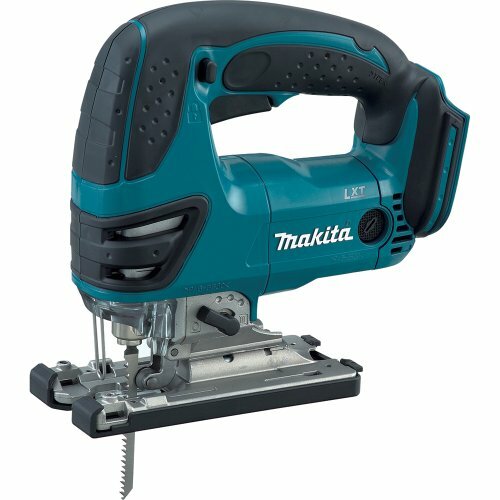 At a purported 5 pounds exactly, Makita’s jigsaw is the lightest cord free jigsaw model in its price class. It has exceptional ergonomic appeal for that reason and because of its comfort grip. It’s light in-hand and runs smoothly regardless of the material you’re using. An LED light helps guide your cuts, and the accompanying six blades let you get started right away. ​Adjusting the base requires a hex wrench, contrasting with the tool-less function of the blade changing system. However, the heft and precision of the base make it worth a little extra fine-tuning. Plus, the quiet motor and maneuverability of the unit allow for use in a variety of settings, making this the do-it-all tool on the job site. The good news is that the Makita does come with a quick release for the blade change. High efficiency in this model makes the most of the battery life, but having an extra on hand never hurts. Like other units in this class, no case or other accessories come with this bare-bones jigsaw. ​This ​Makita Jig Saw makes our list of best cordless jig saws, and out of all the options presented, we think this one works best for professionals. Arguably the most competitive due to its price point, the Porter Cable PCC650B 20-volt Jigsaw is a bare tool (no battery included), but with rich features. It requires a 20-volt lithium-ion battery but comes in at 4.5 pounds overall. Long lasting battery life and variable speed are two top perks. Tool-free adjustments let you change blades easily, and a 45-degree bevel adjustment allows for precision cuts. The manufacturer suggests that cutting wood, metal, sink cutouts, PVC pipe, and even copper pipe becomes simple with the PCC650B. Given the amazing power (20 volt), light weight (4.5 lbs), and plethora of capabilities, it is amazing that this jigsaw is so reasonably priced. ​Despite its low cost, Porter Cable includes a 3-year warranty on the tool, but its construction seems to indicate durability. Smooth and quick cutting without aggressive feedback helps with intricate tasks, even for beginners. A built-in dust blower keeps your cutting line clear, and orbital settings allow for customization depending on the task. Although this model uses T-shank blades, it does arrive with only one, meaning you may need to purchase additional blades before using the unit. For users who already use Porter Cable brand products and have one of their batteries, or another compatible type, on hand, this low cost cordless jig saw is a substantial addition to the toolbox. 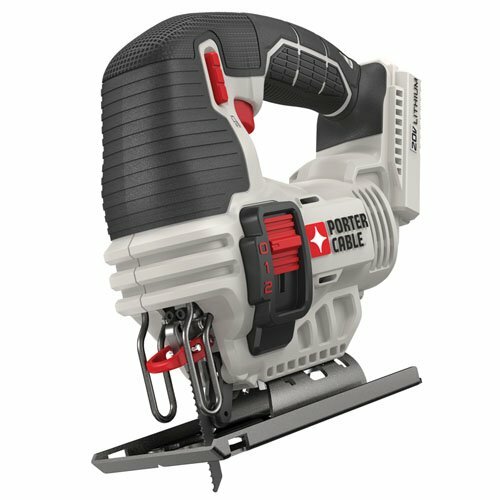 ​Hands down, this Porter Cable Jigsaw wins for best cheap cordless jigsaw. Not all cordless jigsaws have equal features, but they do have benefits over corded models. Apart from not worrying about trip hazards, the best battery powered jigsaw is one that balances must-have features with a reasonable cost. Despite commonalities, many units offer features above their competitors. If you're curious how to pick a great jigsaw that doesn't have a cord, we've listed all of the factors we think are vital below. A jigsaw's power is measured in amps, and relates both to the type and size of the motor on the jigsaw, along with how big the battery is that it comes with. Power is what allows you to make a variety of cuts through a variety of materials. All of the jigsaws in our review have decent power, measuring in the range of 3-4 amps. Higher priced professional models usually have more power, ranging around 5-6 amps. Power is a big component when it comes to cutting tougher materials like metal, but it isn't the only factor to consider. Many models come with a variable speed trigger because you won’t always want to run the same speed depending on the project. Slower speed means more control on fine work, but sometimes you’ll want to speed up for convenience. Variable speeds are nice for several situations. For starters, when you are cutting really thick, difficult material, you'll usually want to opt for a high speed. But, when entering a cut from inside of the wood, starting at a slower speed will guarantee a higher degree of accuracy. In general, more variable speed settings is better. All of the jigsaws on our review have between 3-5 variable speeds. Beyond variable speed, orbital-action jigsaws give additional control over the cutting experience. Orbital-action jigsaws allow the ​blade to move in a slightly circular motion​ as it cuts the material, and you can adjust the orbital action depending on the material you’re using. This allows you to cut material faster, and clears the excess wood chips and sawdust away faster. ​When you see several orbital settings, this is giving you the control to switch between a straight cut to an orbital cut. Straight cuts are better on metal or where precision is vital. Orbital cuts are better on wood where speed is more important (think rough cuts or demolition). For example, on a jigsaw with 3 orbital settings, the 0 setting is used for the straight, up and down motion of the blade. The 3 is used for a curved, elliptical cut through the wood. One note about orbital action: don't confuse it with pendulum action. While similar, they are not referring to the same thing. Pendulum action specifically refers to movement of the blade forward and backwards, whereas orbital action refers to circular movement of the blade. Higher-end jigsaws usually feature a of dust dispersal mechanism. Whether a blower or a dust collector, this function helps keep your view clear and avoids the pileup of sawdust or other material. Still, it’s not a necessary function unless you’re working under extremely precise conditions. A jigsaw with bevel capabilities allows you to change the angle of the cut that the jigsaw makes. So, instead of only being able to cut at a 90 degree angle to the material, you can cut at other angles, most commonly 45 degrees. A bevel function is handy on a jigsaw, it’s an additional perk on top of typical features. A range of bevel angles means you can customize your cut and add decorative touches to a finished piece. Surprisingly, many cord free jigsaws require a separate purchase of a battery. For someone who already has a garage full of tools​, this might not pose an issue, especially if you already have batteries from the same brand. Many units use the same size and voltage battery, enabling you to share between saws. But for people purchasing their first jigsaw, it’s important to note whether you need to add a battery to your cart before checkout. Battery life is another consideration ​in the corded vs cordless jigsaw d​ecision. If you plan to use your jigsaw for extended periods of time, such as on a work site, you’ll want a model with longevity in its battery power. However, purchasing extra batteries also solves the short battery life problem, especially if you plan to use the saw heavily without waiting for batteries to charge. If you opt for a cheaper cordless jig saw that doesn't have a long battery life, do yourself a favor and grab an extra battery. That way, you can alternate charging while you work. Nothing is more frustrating that having to stop half way through your project to wait for your battery to charge. ​With a tool that you need to use daily, comfort is an essential factor. Weight influences how handy the jigsaw is, but cushioned grips can also impact the experience. Comfortable non-slip grip ensures that you can not only wield the jigsaw accurately but safely as well. Believe it or not, some woodworkers prefer a heavier jigsaw. While harder on your hand, more weight makes the saw a little easier to control. In the end, it comes down to your preference. When we grab a battery powered jigsaw, we love the combination of a powerful, lightweight option. However, we know plenty of people who like the extra weight in their hands. Just because they are cordless doesn’t mean all jigsaws are handy to carry around with you. Some units come with extra batteries, equipment, and even carrying cases. If portability is important to you, then those additional features mean that you won’t need to worry about sourcing a case or other items. You want to opt for a jigsaw that provides tool-less blade change capability. Without it, you'll be spending a lot of time changing blades, when this could be made simple just through picking the right saw. Jigsaws are extremely versatile, but you do need to use the right blade for the right material. This means that you might be changing blades quite a bit, depending on the type of project you're tackling. If you're opting for a cordless option, that typically means you value speed and convenience. Tool-less blade change falls into the same category. ​Cordless jigsaws range in price, as does the quality. You can find a decent cordless option in the $50-$100 range. It will be come with a good variety of options, ​usually having several orbital settings and a variable speed trigger. Some of the better options in this price range might also come with a bevel adjustment, and decent power. Our review of the Porter Cable PCC650B is a great example of this type of product, and we love to recommend it. In the cheaper jigsaws, what you'll lose out on is accuracy in your cuts. When you spend more, such as in the $100-$200 price range, you'll get a lot better accuracy with your cuts. You'll also get an expanded range of orbital settings, stronger power, and a few extra bells and whistles like a dust blower. In addition, you often get a more ergonomically designed handle, which is a big plus for longer jobs. Cordless options above $200 are top notch, and typically unnecessary unless you are a professional. However, in this price range, you'll be getting the top of the line product. You'll also get a great brand name with a strong warranty. Do cordless options come with a battery? Usually they do not. Most manufacturers prefer to package and ship their cordless jigsaws without a battery. A lot of the reason for this is that their batteries work universally across all of their cord free power tools. So, for example, if you own a Dewalt drill, chances are pretty high that the battery will also work for a Dewalt jigsaw. However, if you don’t have any other cordless power tools for the brand you’re buying, then you’ll need a battery. Usually they can be bought in a package with the saw. Review the product description carefully to see if a battery is included or not. How long does it take to charge jigsaw batteries? Some brands offer a rapid charging feature, which will allow you to charge in a matter of minutes. This can be really handy if you don’t want to make the investment in several batteries. Otherwise, consider having several batteries. Otherwise, when your battery dries, you’ll have to put your project on hold until the battery charges. Do I need an LED light on my cordless jig saw? The short answer is no. But, they sure are nice. Think through the situations you’ll be using this power saw for. Typically, you’ll grab ​a battery powered jigsaw for cuts while you’re working on a project. Often, you’ll be in tight corners or tricky angles, and a light really comes in handy. Even when you’re in full daylight, such as working in a bright room of the house, the light still comes in handy. So, no, it isn’t necessary at all. But you’ll find it does come in handy. Do blades typically come with a jigsaw purchase? Typically you’ll get one, rather generic blade. This blade will probably serve you well for generic wood cutting, such as cutting through a piece of ½” plywood. Don’t forget one of the biggest benefits of a jigsaw is that you can cut a variety of materials, but only with the correct blade. Without the right jigsaw blade for the material, you’ll have a hard time cutting accurately, and you might break the blade. Today’s jigsaws make is really easy to change a blade so that you can use the jigsaw for all sorts of cuts. All you need is to ensure you have the blades on hand for the material you’re cutting through. Do I really need a cord free jigsaw over a corded option? We're starting to sound like a broken record but, again, that is really up to a matter of personal preference. The upsides are that you'll get lots of convenience, with not much loss of functionality or features. The biggest downside is the cost, although cord free options are typically only 25%-50% more than their corded counterparts. As a matter of fact, many of the manufacturers like Bosch, Dewalt, and Makita make the exact same version in both cordless and corded options. Think through how and where you'll be using your jigsaw. If you tend to do all of your projects in your garage or workstation, then chances are you won't need the cordless features. However, if you have a lot of mobile projects around the house, or your a contractor on the go, you might really benefit from ditching the cord. Can I cut a 2x4 with a jigsaw? Jigsaws can cut 2x4’s but they are not the best saw for this task. If you’re going to be cutting 2x4 pieces of wood with a hand saw, opt for a circular saw instead. However, a jigsaw will do the trick if its all you have. Jigsaws are better suited for cutting wood that is not thicker than 1 ½”, so long as the wood is soft. For harder woods, they’ll have a tough time with anything thicker than ¾”. A jigsaw blade can bend as it cuts through thick wood, which leaves you with a cut that isn’t straight. Using the correct blade for the material you are cutting will help this, though. This is why when you're picking a cordless jigsaw, pay attention to what kind of blades it can accept. When it comes to our cordless jigsaw reviews, it’s hard to differentiate between brands when the features are so competitive. In the end, you have to consider how often you plan to use the saw, what type of projects you want to complete, and how much of an investment you want to make. That said, any of these cord free jigsaws will make a helpful addition to your toolbox, as long as you learn how to use it properly.